Talking about inequality in Europe brings one face-to-face with a complex pattern of possible issues and dimensions, which can be measured in different ways. As Table 1 shows, inequality exists regarding different characteristics such as income, wealth or life expectancy between different entities such as persons, households, sexes, labour and capital, regions or countries. Economics and statistics provide various indicators to measure these inequalities and the choice of indicator is by no means value-free. This article focuses mainly on income inequality. But even if we focus on income inequality, caution is required, since income and prosperity, their development and distribution, point to many problems and pitfalls that also appear in Europe’s development, especially from an international point of view. Income is often defined as Gross Domestic Product (GDP) per capita or as household income based on household surveys. In the EU that is the EU Survey of Income and Living Conditions (SILC). The market income of households is much more unequally distributed than the disposable income, which includes transfers and social benefits while subtracting taxes. Household income can be further adjusted by taking into account household size (net equivalent income) or the non-monetary benefits resulting from public goods or services. Inequality in Europe has three main dimensions: within member states, between member states and in the European Union (EU) altogether. Within member states, inequality has increased in most countries over the last decades. This is the well-known phenomenon that contributed to the rise of populism. Between member states, the analysis has to take into account the effects of changes in the exchange and inflation rates, too. Accordingly, when comparing real incomes, the use of purchasing power parities (PPP) makes more sense than a comparison at exchange rates. The income per capita in PPP is usually higher in poorer member states than the one measured in exchange rates, since many things are cheaper there. Thus, inequality between countries is lower if measured at PPP. In the context of a catch-up process, when between-country inequality decreases and the income level of poorer member states comes closer to that of the richer ones, a real re-evaluation usually takes place, mostly accompanied by a nominal currency appreciation and/or a higher inflation rate, thus tending to reduce the difference between the purchasing power and the exchange rate. Determining Europe-wide inequality requires analyzing the distribution of income within and between countries. Analogous to Branko Milanovic’s three concepts of inequality (see Figure 1) one can differentiate between three variants: international inequality, which disregards the different sizes of populations, (concept 1), population-weighted international inequality (concept 2) and true global inequality, which compares all people regardless of their nationality (concept 3). In order to measure concept 3 inequality for the EU, one has to consolidate all national SILC household survey data. A shorter approximation uses the S80/S20 ratio (see below) and constructs the quintiles of the EU population using the appropriate national quintiles (for example Dauderstädt/Keltek). EU-wide inequality is determined by the gap between poorer and richer member states and the inequality within member states. 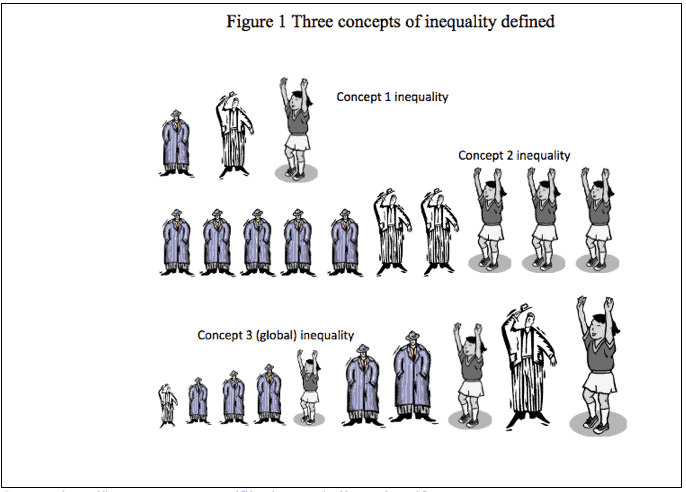 The level of inequality increases from concept 1 to concept 3. In order to measure the distribution of income, one can use a variety of indicators (see last column of Table 1). The Gini ranges between Zero (equal distribution) and 1 (or 100), when one person gets all the income. The Theil is useful because it can be decomposed between inequality between and within member states. The S80/S20 ratio is the relation between the income of the top 20 percent and the bottom 20 percent of the income distribution. The Chilean economist Palma has introduced a similar ratio of the relation between the top 10 percent and the bottom 40 percent as he had observed that the share of the middle 50 percent remains relatively constant while overall inequality varies dramatically. While these latter indicators measure relative inequality, others such as standard deviation look at absolute inequality. The picture of the development of inequality can appear quite different depending on the use of indicator. When lower incomes grow faster than higher incomes (economists call that “beta convergence”), the distance between the lower and higher incomes can still continue to grow for a while (depending on the original relationship). In this case, the standard deviation increases, too (so no “sigma convergence” in economists’ terminology). Thus, the use of an indicator involves moral and political preferences: Are you more concerned with the absolute difference between income levels or their relative ratio? Michael Dauderstädt is a freelance consultant and writer. Until 2013, he was director of the division for Economic and Social Policy of the Friedrich-Ebert-Stiftung (FES).